Rabbi Dr. Yaakov Neuberger as he reminisces about his youth in Yeshiva Torah Vodaath. Rabbi Dr. Yaakov Neuberger joined Yeshiva Torah Vodaath soon after arriving from Germany at the onset of WWII. During his years in Yeshiva Torah Vodaath, he learned from some of the great Roshei Yeshivah who led Torah Vodaath during that era. Beginning in 1968, he delivered the Daf Yomi shiur in Bais Aharon (the shul of Harav Tzvi Mordechai Felder, zt”l) in Boro Park, and to this day he continues teaching the daf to a group which meets in his home. Why did your parents choose to send you to Yeshiva Torah Vodaath? My parents emigrated to the United States with my two sisters, Gretel and Sara Hinda, from Wurzburg, Germany, in September 1938. Once there, they worked feverishly to arrange the papers needed for the rest of the family to join them. My sister Rus (13 years old), brother Ari (age 7), and I (11 years old) were sent to stay with our aunt, my mother’s sister, in Munich. During that time, I observed the atrocities of Kristallnacht as they unfolded. Since my aunt’s husband was a Polish citizen, they were deported, but managed to return five days later. During her absence, we stayed with Harav Yisrael Ehrentreu, zt”l, over Shabbos. Unfortunately, my oldest brother, Avrohom, was in Holland at the time, and he was transported to Bergen Belsen where he perished just a few days before its liberation. After a few months our papers arrived, and my parents paid for a non-Jewish lady to accompany us on the boat to America. The boat ride was extremely difficult for me, as I was seasick the entire voyage. We arrived in Baltimore in February 1939, and my father, who was a medical doctor, tried to be certified to practice in Maryland. When he realized that it was too difficult to be certified there, we moved to New York, where my father spent a year and a half learning English and taking his Board exams. We lived in Williamsburg at 590 Bedford Avenue, and my father treated many patients from the Jewish community for many years. I entered the Mesivta in the middle of the school year in 1939. I had attended the Judishe Deutsche Folkshule in Wurzburg, and the student body was mostly irreligious. I did receive supplementary private lessons, but when I entered the Mesivta I was woefully undereducated. Harav Avrohom Pam, zt”l, was my first Rebbi, and he was a master, the best Rebbi I ever had. At the end of my first year in Torah Vodaath, I was able to mach aleinis (learn the Gemara on my own), which was quite an accomplishment. Which Rebbi, Menahel or Rosh Yeshivah did you associate with while in the yeshivah? I had many wonderful Rebbeim in the years I attended Yeshiva Torah Vodaath. Aside from Rav Pam, I had Harav Dovid Bender, zt”l, who eventually became the Menahel of the older grades in the elementary school. I also had Harav Gedalia Schorr, zt”l, who I recall was extremely quick, and it was difficult to keep up. 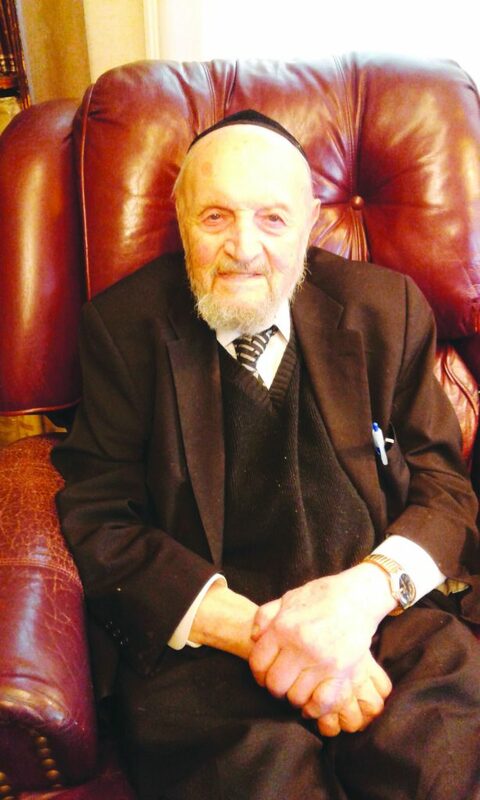 In twelfth grade, we began the zman (1943-1944) with Harav Yisrael Chaim Kaplan, zt”l, the son-in-law of Harav Yeruchom Levovitz, zt”l, the legendary Mashgiach of the Mir. In the middle of the year, Rav Yisrael Chaim was chosen to be Mashgiach in Bais Medrash Elyon, and Harav Aharon Yeshaya Shapiro, zt”l, took over the shiur. We then had Rav Schorr again, as well as Harav Shmuel Kushelewitz, zt”l. I had Harav Yaakov Kamenetsky, zt”l, for a short while after Pesach of 1945.
Who were your classmates and friends in YTV? I was very close to several of my classmates. Reb Yosef Baumgarten, z”l, Reb Sholom Stern, z”l, and ybl”c, Harav Yitzchak Kirzner, shlita, and I were dubbed “The Big Four,” a takeoff of the four world leaders at the time, namely FDR, Stalin, Churchill and De Gaulle. Rav Kirzner was an iluy, and he served as one of the bachurim to whom Harav Reuven Grozovsky, zt”l, would say his shiur before delivering it to the entire yeshivah. I was friendly with Harav Yaakov Schiff, who married the daughter of the Brisker Rav, zt”l. In addition, Reb Dovid Svei, zt”l, a brother of Harav Elya Svei, zt”l, was a talmid in the yeshivah at the time, and he married a niece of Harav Shraga Feivel Mendlowitz, zt”l. Harav Mottel Weinberg, zt”l, was also a talmid before he left to Telshe in Cleveland. He eventually was Rosh Yeshivah in Yeshiva Gedolah of Montreal. There were also others who went on to become leaders in the field of chinuch. Reb Avraham Abba Freedman, zt”l, was sent along with Reb Sholom Goldstein, zt”l, to open a yeshivah in Detroit. With great mesirus nefesh, they established one of the prototypes for yeshivos and day schools in out-of-town communities. Today, Detroit boasts one of the finest yeshivah communities in the entire country. What is your fondest memory of your Yeshiva Torah Vodaath experience? I always loved the special davening of the Yamim Nora’im in the yeshivah. Harav Manis Mandel, zt”l, davened with such hartz, and the beautiful niggunim that were sung were inspirational. Although I left Yeshiva Torah Vodaath after high school and attended Yeshiva Ner Yisroel in Baltimore after Harav Yaakov Yitzchok Ruderman, zt”l, requested I transfer there (my cousin, Rabbi Herman Neuberger, z”l, was Rav Ruderman’s brother-in-law and the executive director of the yeshivah), I still longed for the unforgettable davening of Torah Vodaath. I spent five years in Yeshiva Ner Yisroel and received semichah from Rav Ruderman. When I returned to New York several years later, I once again began davening at Yeshiva Torah Vodaath during the Yamim Nora’im, as I was drawn to the beauty of the tefillos from my years in the yeshivah. During my first year, I participated in the yeshivah’s move from their building on Bedford, corner of Taylor, to their new home on South Third Street. The parade to the new building was a momentous and memorable experience. Tell us about your grandchildren who learned in Torah Vodaath. Nine of my grandchildren, the children of Mr. and Mrs. Heshy and Naomie Loewy, attended Yeshiva Torah Vodaath over the past few decades. Heshy himself graduated in 1970, and his oldest son graduated in 1995, exactly half a century after I graduated in 1945. The youngest son graduated in June, 2018. So, my family is associated with Torah Vodaath for 76 years, more than three quarters of a century. What would you like to see in the future for Yeshiva Torah Vodaath? I would love the yeshivah to once again be filled with talmidim who will continue the glorious legacy of the yeshivah for the last century.